much time to make something. This is where this wonderful book comes in handy. you can have a perfect beautiful baby shower gift made. You can either make one item or a set of items. how much you want to make. 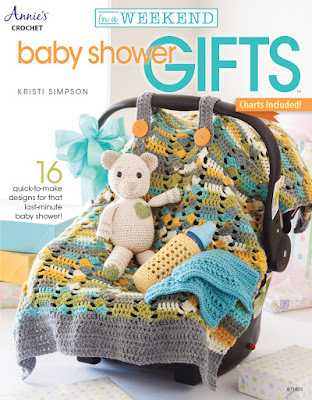 give as a gift for a baby shower. The third section "Quick & Easy Cuties"
has a super cute headband & burp cloth. The fourth section "On-the-Go Accessories"
includes a bib, sweater, car seat blanket & bottle cozy. & car seat carrier cover. You have a stitch guide at the back as well as metric conversion charts. That way everyone is covered. something to make within the book. impact at any baby shower. The mother is sure to love them.